December is not the time to talk about fresh tomatoes. However, several recent trips to the farmer’s market have had tomatoes. Having faith in the vendor, I went ahead and bought them. They had a nice red color, so…. After leaving the farmer’s market, I stopped at the local grocery. Browsing their fabulous cheese section with no real intention of buying, one of the employees suggested I try a particular cheese called Le Roule. I also picked up some poboy rolls from New Orleans to make sandwiches for the family. By the time I got home and unpacked all the groceries, I realized I was starving! I examined the cheese. 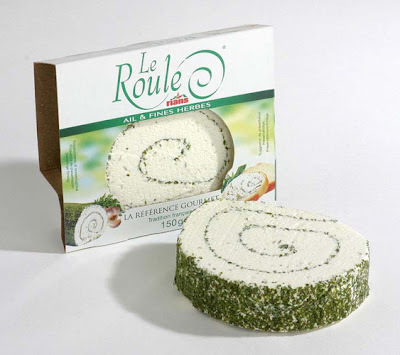 It was coated in herbs, with a spiral of herbs in the center: a jelly roll of herbed cheese! Turns out, what I thought was goat cheese, is actually made with cow’s milk. Still, looked like a great cheese. Somewhere between the consistency of a chevre and a cream cheese, with a texture a little more buttery than a chevre (goat cheese). I sliced the poboy roll in half, spread a little bit of butter, and popped it in the oven. After about 8 minutes of toasted, I pulled it out, placed a hearty layer of those tomatoes, spread a thick layer of the herbed cheese, and put it back in the oven to warm the cheese. What a combination. Nothing new, just a really great mix of the right ingredients. It also dawned on me, that this would make a great lunch at my desk for all those days when all I want is a grilled cheese sandwich, but not a greasy restaurant grilled cheese, with the fries and all. If you have a toaster oven in your office, it works well. I tried it yesterday and it was great; very satisfying. The Le Roule cheese is very creamy and buttery, even more so when warmed up. 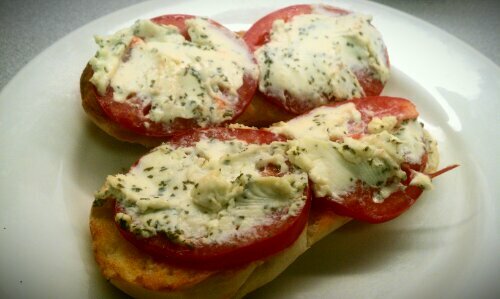 The tomatoes were juicy and flavorful. So juicy, in fact, that they turned the warmed cheese pink after toasting. No salt needed, maybe only a little black pepper. Goes great with a light soup or salad at the desk.